Faf du Plessis enrout to his 82 off 107 balls. A match high on emotions and drama in front of jam packed 45,000 Eden Park crowd in Auckland, saw the Kiwis triumph and made them win their first ever World Cup Final spot and break their long old semi-final jinx. They won by 6 wickets and one ball to spare, in a semi-final which was equally hard fought from both the sides. Opting to bat first on a flat pitch after winning the toss, the Porteas received two early blows in their innings as their prolific opener Hashim Amla was bowled by pacer Trent Boult, who had earlier dropped him, and departed for 10 runs. 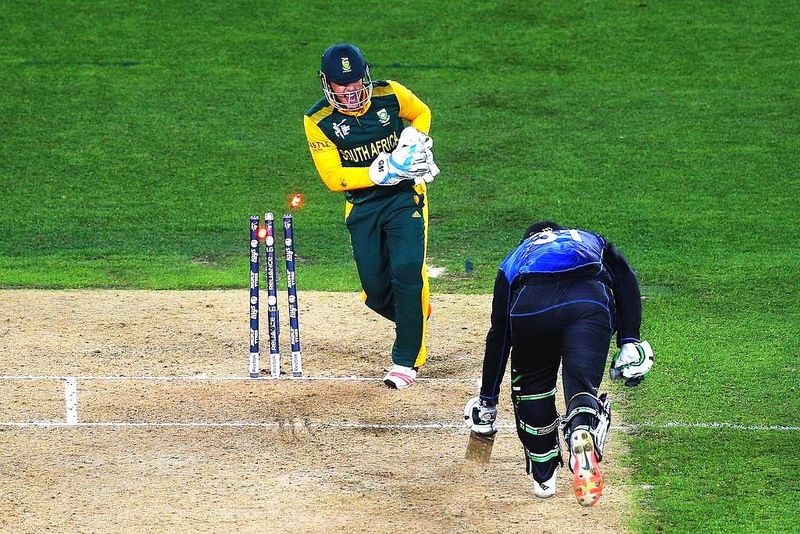 Soon Quinton de Kock, who was not looking at ease in the middle and also had been dropped initially, jumped at a ball from Boult which landed straight in the hands of Tim Southee positioned at third man, and the Africans were reduced to 31 for 2 in just 8 overs. With Boult's ball swinging to perfection and a couple of batsmen back to the pavilion the New Zealanders were on top. 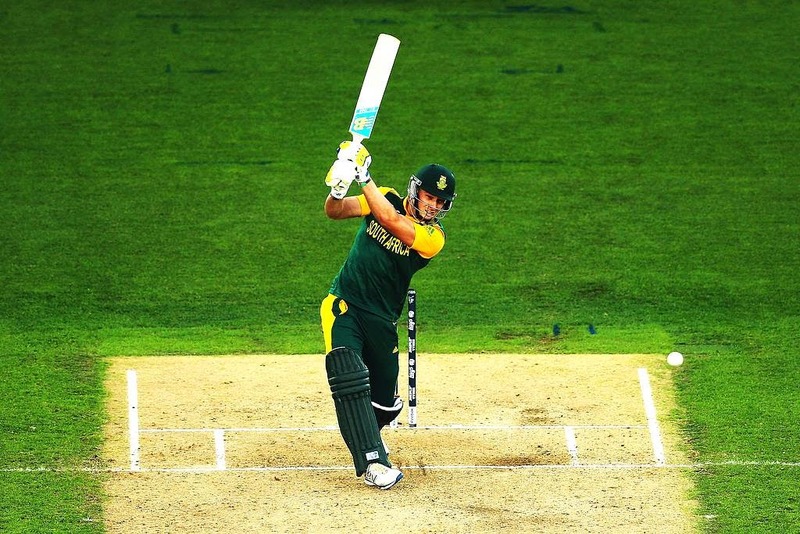 However, two new men at the crease, Faf du Plessis and Rilee Rossouw went ahead to stabilize the South African innings by rotating the strike periodically and hitting the good balls to the fence, before Rilee Rossouw gave away his wicket. Rossouw who was looking in decent touch punched Corey Anderson's ball to backward point, where Martin Guptill completed a great catch. This brought the Porteas captain AB de Villiers to the middle, in the 27th over of their innings . De Villiers along with a much calmer Faf du Plessis on the other end stringed in a crucial and steady the part timpartnership for their team, by withstanding the pressure. Faf started to open up as he hit speedster Henry for a six in the 31st over. After this de Villiers too showed some aggression by clearing the fence and hitting Corey Anderson for 14 runs in just three balls, charging down the pitch in the 36th over. A score of 320 plus seemed to be in the hindsight, as the Kiwi bowlers had no answers to perfect stroke making of de Villiers during the powerplay, but rain played a spoil sport and the players were asked to evacuate the ground after 38 overs of play when the South Africans had a great edge over New Zealand with a score of 216-3. The result of more than an our long rain was the reduction to 43 overs per side with each bowler getting to bowl a maximum of 9 overs. 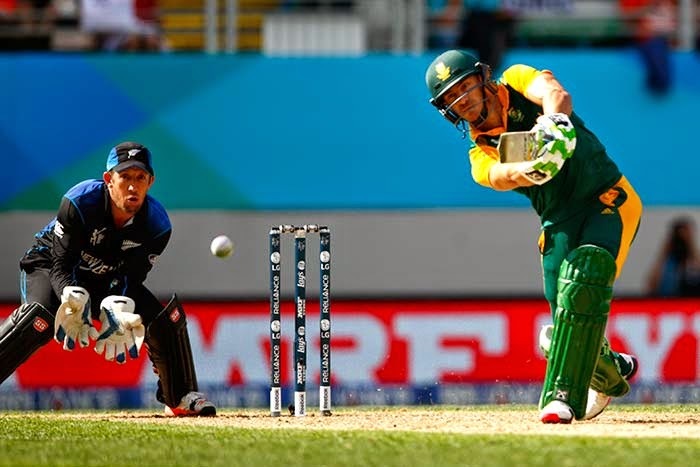 As soon as the game resumed, Faf du Plessis apparantely nicked a ball of Corey Anderson,who started the proceedings for New Zealand, into the hands of Ronchi the keeper, and it was called wide by the umpire. The Kiwis went up for a review and as a consequence Faf du Plessis departed for a well made 82 off 107 balls under pressure hitting 7 fours and a maximum. David Miller smashed a brilliant 49 of just 17 balls. It appeared as if rain had brought back the momentum to the Kiwis, but when Miller arrived it was a rain of boundaries. Killer Miller brought along with him sheer destruction for the New Zealand bowlers and hit a swashbuckling 49 off 17 balls, with six fours and 3 sixes until he hit Anderson's ball into Luke Ronchi's gloves behind the stumps. The result of David Miller's carnage was a South African total of 281-5 in 43 overs, with runs coming at the rate of 13.00 in the last five overs. As for the New Zealand bowling card, Southee went wicktless giving 55 runs in his 9 overs and Trent Boult claimed two scalps for 53 in his quota of reduced 9 overs. The spin of Daniel Vettori too bore no fruit as he did not pick a single wicket in his 9 overs. Corey Anderson although earned three wickets but leaked away far too many runs in his overs. The column for Henry read 0-46 in his 8 overs. According to the Duckworth-Lewis method, New Zealand had to chase down a revised score of 298 runs in 43 over at the rate of 6.93 RPO. To make their dream for earning a maiden spot in the finals, the Kiwis needed a flying start to their innings, and who better than their superman McCullum. He smashed world no. 2 Dale Steyn all over the park and the bowler ended up giving 39 runs in his initial 3 overs. 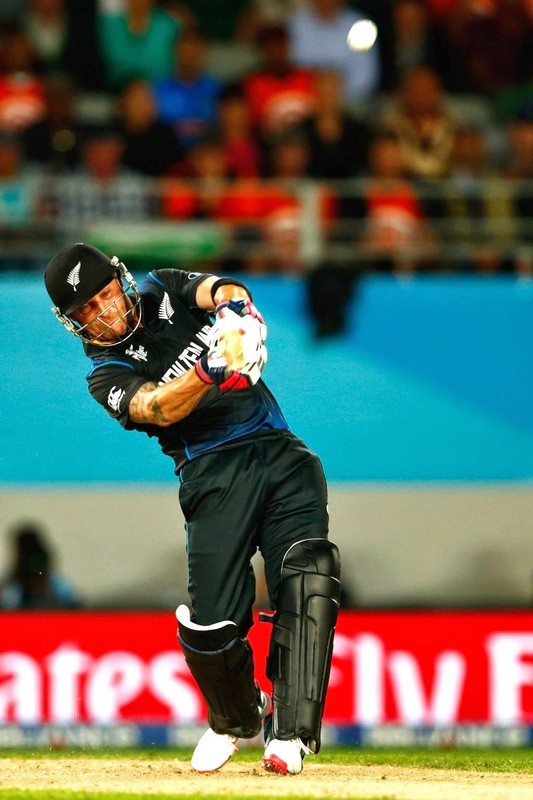 The result of McCullum's exuberant shots was the Kiwi score of 71 runs in mere 5 overs. McCullum set the run chase up for his team. The result of Tahir's maiden over was the end of Bendon's astounding 59 runs of just 26 balls in the first ball of the next over, as he hit Morne Morkel's ball into Dale Steyn's hands. After providing the Porteas a much needed breakthrough, Morkel followed it up with another scalp, by bowling Kane Williamson over for just 6 runs. New batsman Ross Taylor and opener Martin Guptill on the other end, made it steady sailing for New Zealand uptil the 18th over, when there was a mix up between the two and ended in the double centurion of the last match, Martin Guptill run out for 34 runs. Four hours later JP Dumminy provided another massive breakthrough to his team in the form of Ross Taylor as he nicked an outside edge to Quinton de Kock. Martin Guptill is run out after a good throw from Amla. Corey Anderson and Grant Elliott took responsibility, and provided a much needed partnership to their team. Corey Anderson unlike his natural stroke play, pushed the ball, rotated the strike with Elliott, and hit loose balls to the fence and ended up in making a 100 run stand along with his partner. In between there were missed chances by South Africa. AB de Villiers missed a crucial run out of Anderson in the 32nd over, as he knocked the bails with his hands without the ball. The Kiwis were easily cruising towards the total, till Morkel came with his 38th over and bowled first three deliveries as dot balls. the pressure built up and Corey Anderson hit a short of length ball high up in the air and Faf du Plessis complete a brilliant catch at square-leg. This ended his 103 run partnership with Elliott and brought Luke Ronchi to the crease, who too departed a couple of overs later, hitting an aerial shot off Steyn which was pouched by Roussouw at mid-wicket. The match seemed to be slightly New Zealand's favour, but a lot of work was yet to be done. This was when Grant Elliott with his nerves of steel, had something special to offer for his team. The Kiwis required another 29 runs in 3 overs and each dot ball was doubling up the pressure. The pressure on the other side resulted a catch of Elliott being dropped as the fielders collided amongst each other. With 12 required of the last over Steyn, only gave 2 runs of his first two balls. Drama built up as Steyn suffered from cramps and the physios came on the field. 10 was needed of 4 deliveries and Vettori played his role by hitting ball for four. With just 5 required of 2 balls, Elliott finished his wonderfully constructed innings with a six and sealed a spot for his team in the finals. Ecstatic Grant Elliott after striking the victory six. While there was a deafening roar from the crowd and the Kiwis were jubilant, the African players were seen with tears in their eyes. Morkel gave it all and grabbed three wickets for 59. Imran Tahir although was wicketless he did not leak away many runs. In an encounter of two of the strongest teams in the extravaganza, New Zealand handled pressure well, kept their nerves and crossed the line by scripting a dream win. Rain along with the D/L method yet again did not favour the Porteas.Their fielding which has been one of their major strengths was sloppy today. It was McCullum who set it up beautifully for the Kiwis. There was a tooth and nail fight but Grant Elliott took his team through, and allowed the home crowd at Auckland, to witness a victory that will be remembered for a long time to come. New Zealand establish a thrilling victory over South Africa to reach the finals.